Demand response is a crucial mechanism for flattening of peak loads. For its implementation, we not only require consumers who react to price changes, but also intelligent strategies to select prices. 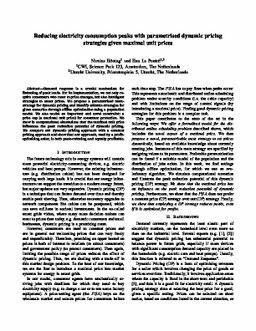 We propose a parametrised meta-strategy for dynamic pricing and identify suitable strategies for given scenarios through offline optimisation using a population model. We also model an important and novel constraint: a price cap (a maximal unit price) for consumer protection. We show in computational simulations that the maximal unit price influences the peak reduction potential of dynamic pricing. We compare our dynamic pricing approach with a constant pricing approach and show that our approach, used by a profit-optimising seller, is both peak-reducing and equally profitable.